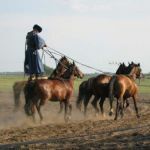 Spend an unforgettable day in the Hungarian Great Plain, (350 km travel, about 6 hours) known more about the Hungarian horse traditions of the famous Lipizzaner horses of the horse race, Nonius. Know more about puszta life. The romantic scenery with the wide horisonts covers almost half of the country. Pastures succeeded by plantations of sunflowers, corn, apricot, apple. In this program, you will be picked up at your hotel in the morning and travel with a professional guide to the horse park. Horse park is located 150 km from Budapest so cca. one hour car or busresa. The park's owner is actually world champion in show riding, in two and four horses driving. Where do you get a glass of "Barack Palinka" apricot schnapps a welcome drink and "pogácsa" which is a homemade bakery with the taste of cheese or bacon flavour. After receiving the famous welcome drink, guests are invited to go on a horse and carriage. Always so fun. Then you see the stud farm, the museum, the small animal farm with puszta typical animals, such as hand-get, the Hungarian gray cattle, etc.. The program continues with a tradition Mews horse show which is the combination of several enanstående föreställningar.Ni can get a good glimpse of the horses' beauty, elegance, temperament, etc. hästkarlens attire. A Hungarian "Csikos" can ride without a saddle. It allows the rider quickly and without loss of time can follow the horses rushed away. The karakteriska shepherd costume and ring the whip also belongs to the Hungarian hästkarlens, "Csikos" hesteherd special features. Did you know that the carriage of Hungarian "kocsi" English coach is named after a small Hungarian village, whose inhabitants lived in producing cars and provide transportation. Hästuppvisningens highlight is the famous "whiff fifth grade," You offered then to a three-course Hungarian real country cooking including the famous Hungarian gulashsoppan., With red, white wine. You can eat as much as you can handle, so Puff Program is a good Aktivität for happy eaters in gulashsoppans homeland. It's not that hard to put on weight a few kilos during the visit in Hungary. Full and happy car, the bus rides back to Budapest program ends at the hotel. Prices: minimum 4 persons fr. EUR 90 per person (min. 4 persons) For larger groups, the price will obviously be cheaper. 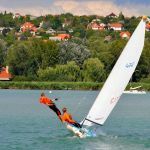 Experience Budapest with a very popular boat trip on the mighty Danube. An excellent way to see both Buda and Pest side. You go under the Budapest bridges and get to enjoy this beautiful city while many attractions pass by. 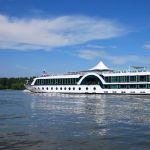 There are several companies offering boat trips with various departures daily and evening. Evening tours are nicest when the whole city, and many of the bridges are lit up in a fabulous way. Take a trip for pleasure! Let us book and you have to pay on the spot! The boat departs from the inner city, but if you need a transfer, we can fix it.